Rain's Garden: March - Out Like A Lion - Booo! Hissss! The good news is that the daytime temperatures will mostly reach above freezing so hopefully the 50cm or so of predicted snow will melt off gradually but definitely. I'm just hoping I don't have to take the car out because I refuse to shovel anymore...if I have to drive, I'm just revving up and plowing right through it! Alex did shovel a little...he had to dig under about two feet of snow and ice for the dog tie-out stake he put into the ground last summer. It's been so sunny and mild in the daytime that I wanted to take advantage and let the dogs out on their ropes. Our errant husky issue seems to have solved itself. The trap has been empty the whole week, no sign of the loose dog, so we felt comfy letting the pack out to enjoy the sunshine. The huskies and Pavlov love to be in the snow, they always find something interesting to keep their attention! Every week I challenge myself to a new recipe and post about it on Sundays. 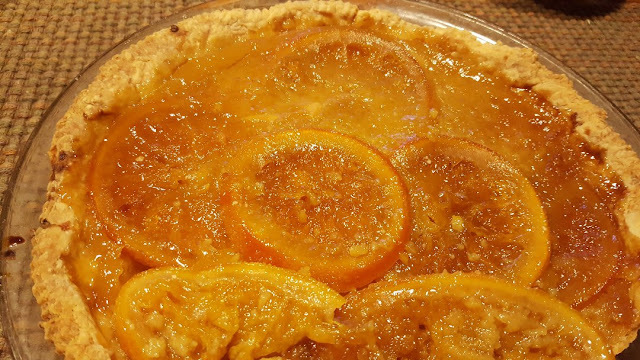 Here is the latest: Shaker Orange Pie. This was really easy to make and delicious, orange rinds and all! They got very chewy and candied in the baking process. The colours were pretty darn cheerful too! Hope you're having a nice Sunday! our snow might be done for this year. i hate to see it go but whatcha gonna do?! i made a shaker lemon pie once and it was awful. glad yours turned out. we wil have weather in the 60's this week but at least it will rain! I know I laughed and laughed at the groundhog's predictions for 6 more weeks of winter - as we were having such mild weather at the time. Guess he's getting the last laugh. All your pictures are great, Rain. The dogs outside look so happy! Well, Jack maybe looks a little bored, but the photo of him and Stella look great. (I hope I got the names attributed correctly.) And your orange pie - oh my! I've never even heard of orange pie. Wow! That pie looks so good, never had orange pie. It's been so cold what a long winter. Post card pictures of the puppies! I want to hug 'em! That is a lot of snow in the forecast!! Hopefully the weather people are wrong! your dogs are so handsome standing in the sun,, they are all beautiful, so healthy and happy. 4 degrees?! Where do you live, on the moon?? Oh, wait...celcius...so 8 kilometers then? Hahahahah...my side hurts. Your pack looks quite happy to be out in the snow. But in my mind, Jack and Stella are the smart ones to be laying outside in the sunshine without getting wet and cold paws. Your pie looks pretty. Not an orange fan here but I love the smell of oranges so I can imagine how wonderful your home smelled with that pie baking. Good gracious, your outdoor pictures look like full-blown winter time! (Feels like it, too, she says.) At least our snow continues to melt. Not such a good forecast for tomorrow, but if we just get the rain instead of the snow/sleet/ice, etc. more snow will disappear. I've never heard of the orange pie you made either. I'm not much for candied fruit rinds . . . but I'd be willing to try a small piece of that pie! Windy and cold here, but no snow. Surely things will start getting nicer soon. The dogs look like they are happy, though. On a scale of 1 x 10, how delicious was that pie? Your snow is our rain. I didn't realize your weather was, at times, much different than ours since we're not too far away from each other. Must be the mountains. I wouldn't shovel either at this point. There comes a time when enough is enough! It is exciting that soon we'll be spending a lot of time outdoors! Even if March has been a royal pain in the behind, it's antics are coming to an end. Glad you got in some vitamin C recently before that weather moves in. I spent my Sunday morning, in the very cold wind, cutting and splitting wood with my husband. It was too cold for March. So glad the "bad dog" issue seems to be solved! So glad your pack can get out and enjoy some sun!!!! Hope your snow melts. Ours has but we are a lot more *south,* than you are. As far as normal temps are concerned. Orange pie? Never heard of making a pie with oranges! How neat..I love oranges and esp love to squeeze into my tea! That looks so yummy. I am so proud of you for cooking something new all the time like that. That is awesome. Have you ran across anything that you would not make again? I am so glad I don't live where I have to shovel. I would never get it done. One..the only male that lives with me is a dog and with my fibro and cold....it just would not happen. Great that you have Alex! I so love checking in on you to see how things are going. I think I am going to buy my herbs already started. I have NO luck starting and moving them. Do herbs need a lot of room? I'm trying to do one new recipe per week too. Today I'm going to bake cheese-and-spinach stuffed big pasta shells in a tomato sauce. Wish me luck! We had a lot of rain last weekend and snow yesterday crazy weather! Least the sun is out today and just cool and clear. I've made orange chiffon pies before those are great! Love this post but i didn’t realise how much snow you guys get. Dogs on Snow. Makes me laugh. Pretty sure Poppy would have no idea what to do on actual snow except to beat a hasty retreat. March is a treacherous month. Beware the Ides of March and all that. Julius Caesar was murdered in March, so I rest my case. Delicious looking pie, by the way. I love the pictures of your fur babies! They are all so beautiful! Shaker Orange Pie??? Never heard of it before! Sounds so good! Thank you! Happy Easter! Big Hugs! 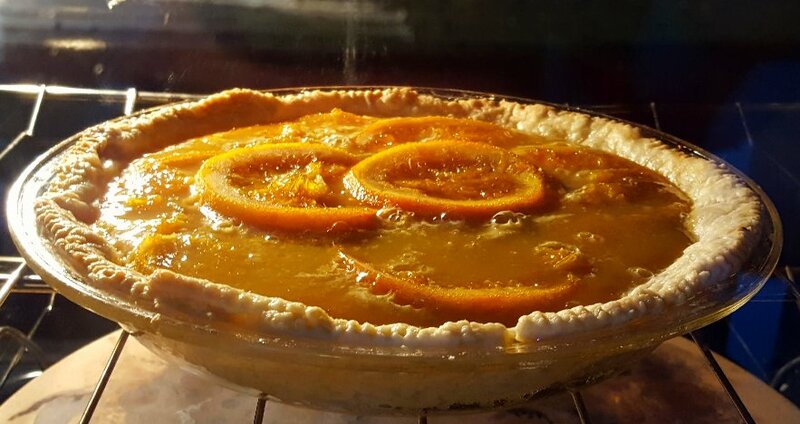 this orange pie is looking so inviting!! !